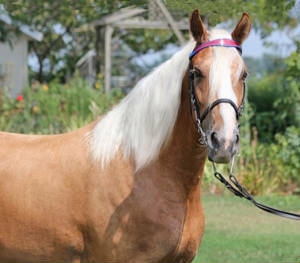 All our horses are Tennessee Walkers chosen from good heritage bloodlines. We do not train them for high-stepping show-ring gaits. Our horses all have natural smooth-riding gaits and are well suited for trail riding. They have friendly, calm, and sane temperaments. 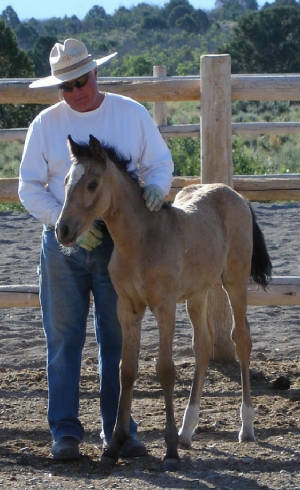 Our plan is to have good horses focusing on their gait, temperment and then the Buckskin or Palomino color. We want heritage-line horses perfect for trail riding. Our horses are allowed to be horses with plenty of free range exercise, no funny shoeing or high heels, no clipping but with plenty of shelter water and feed. Running alongside the Ranch is the 26 mile Gurley Trail which is one of the finest horse riding trail systems in Colorado... perfect for Tennessee Walkers. 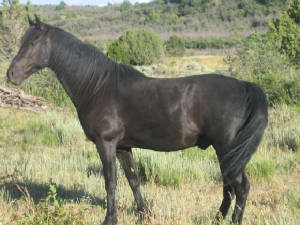 This is "Mighty", Howard's beautiful Tennessee Walker gelding. This breed is known for its terrific temperament and loving personality. Mighty is the clown of the herd often using his high intelect to find all sorts of mischief to get into. 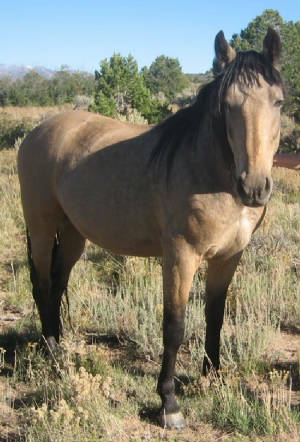 This is Bandit's Ultra Marie ("Duchess") and she is a Palomino Tennessee Walker. She has a terrific natural gait and is a wonderful trail horse. Her personality and temperament are sweet and special and her breeding is exceptional. Lots of Old Time Heritage class in her background. You can drink champagne as she gaits and not clink your teeth. WR Sheila Big Heart was born on May 3, 2008. Here she is seeing goats for the first time - she is 6 weeks old. Her mother unfortunately passed away from complications 9 hours after giving birth and Sheila was hand raised through the summer of 2008. Luckily Buddy, Jeannie's gelding, took it upon himself to be Sheila's surrogate mom and she has turned out the sweetest little horse imaginable. Sheila is not for sale. 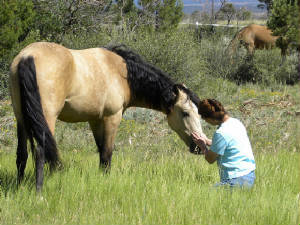 Jeannie's riding horse is "Buddy", a 14.3 hand gelding with the much sought after Buckskin color. A former stud stallion, he still thinks he's the boss of the herd.